Thrive! 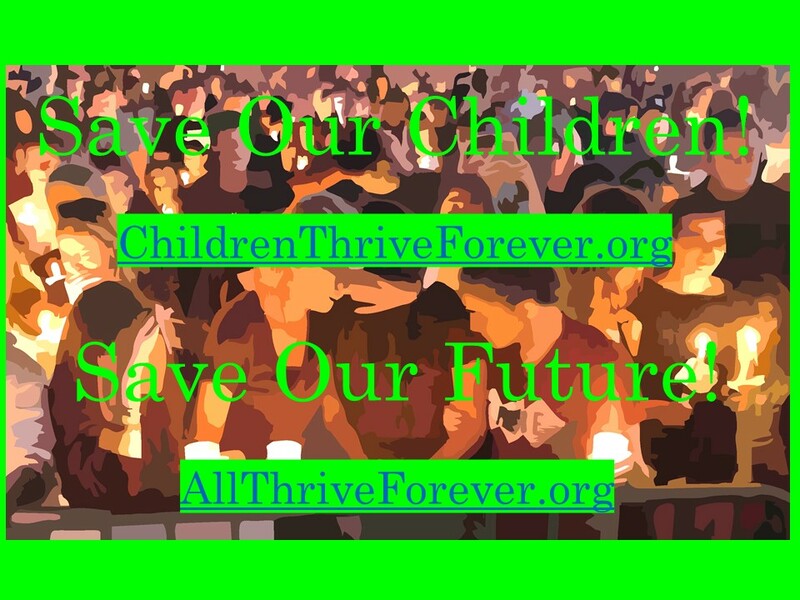 - Building A Thriving Future for All Forever | To achieve thriving future, what will you do? 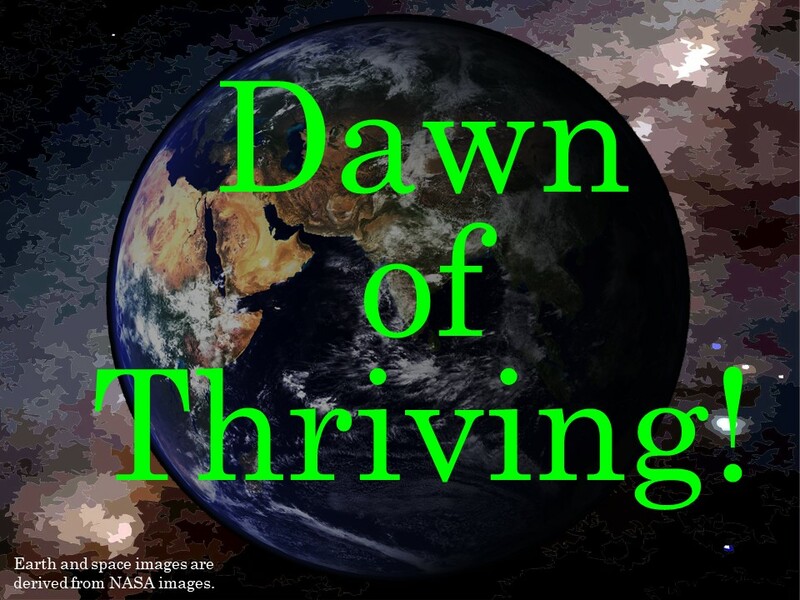 Example: To achieve thriving future [for all forever], we (Thrive!) created and lead “Thrive! – All Thrive Forever” and the “Thrive! Endeavor”. 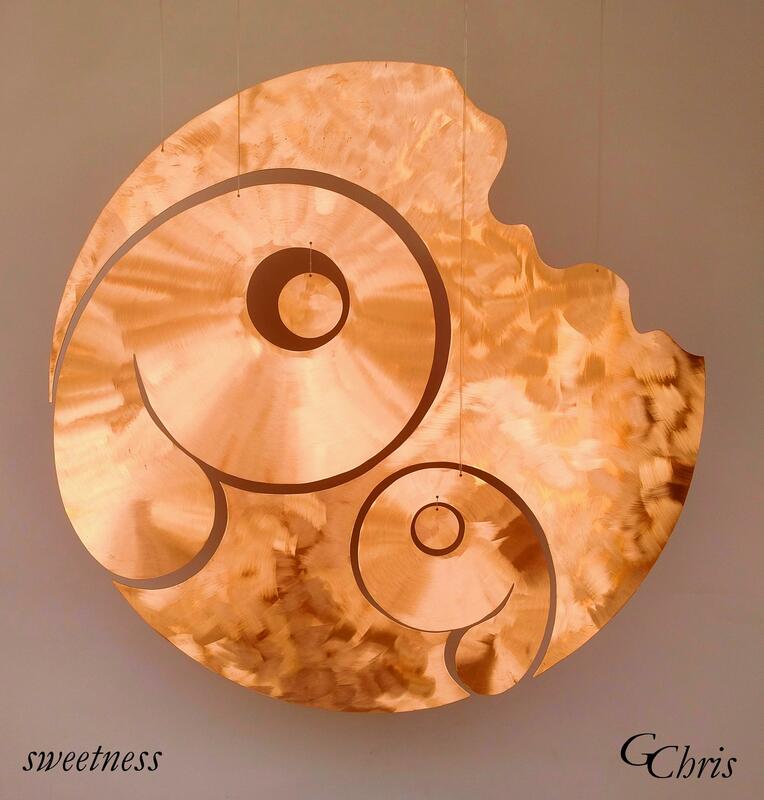 New – “sweetness” – Thrive! sculpture by GChris. 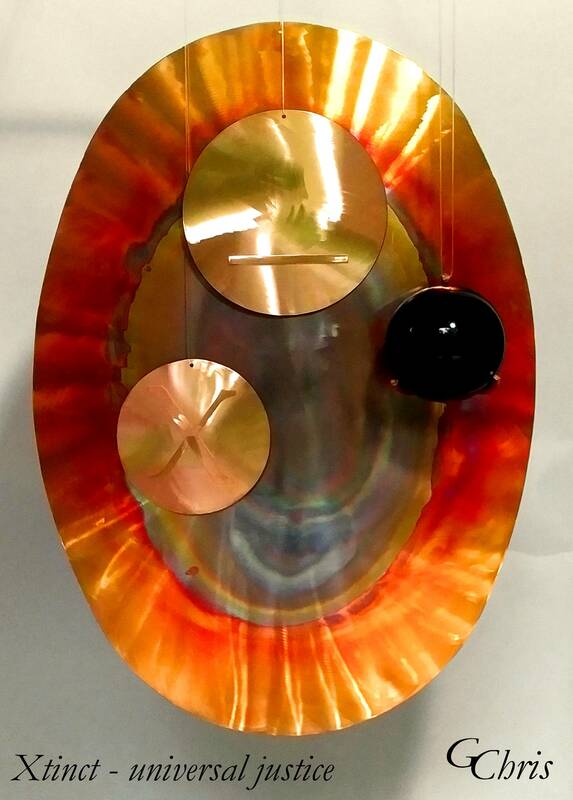 3′ x 3′ metal mobile. Message – Challenges all of us to celebrate and nurture the sweetness, with a bit of whimsey, in all creatures. Sweetness can and should be a blessing. Care must be taken to avoid it becoming a curse. 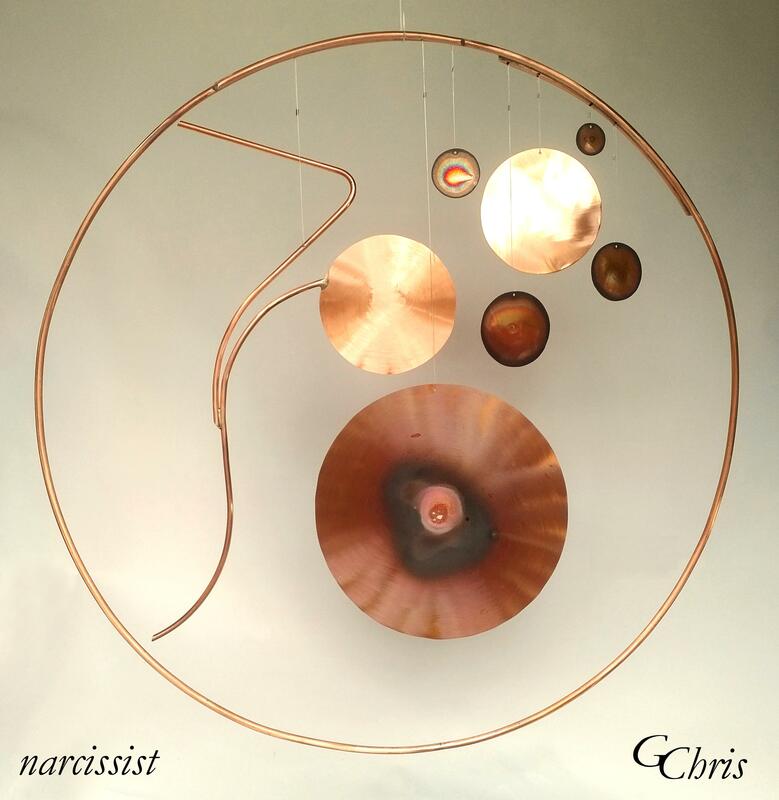 New – “narcissist” – Thrive! sculpture by GChris. Message: Narcissist. Selfish, short-sighted destroyer of the good. Of the future. Of a thriving future. Challenges all of us to prevent narcissists from destroying our and our children’s potential for a surviving and thriving future. New – “Shepherd – universal justice” – Thrive! sculpture by GChris. 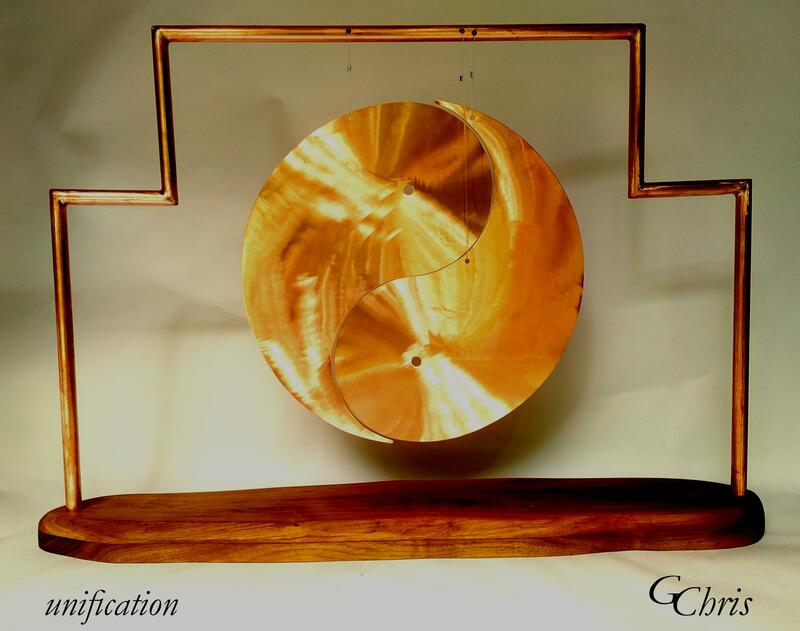 2′ x 3′ metal mobile. Message: Unless humans change their behavior immediately, humans’ failure risks early extinction for humans, all other creatures and Earth. Note: Shepherd is a key character in Chris’ illustrated science fiction book – “Xtinct – Universal Justice for Earth,” When humans face early extinction due to their own failures, Shepherd partners with humans to prevent early extinction and achieve a thriving future. Shepherd is also the key figure in Chris’ two science fiction novels – “black box”, “The Thrive! Endeavor”. New – “Xtinct – universal justice” – Thrive! sculpture by GChris. Message: Human’s failure risk early extinction for humans, all other creatures and Earth. 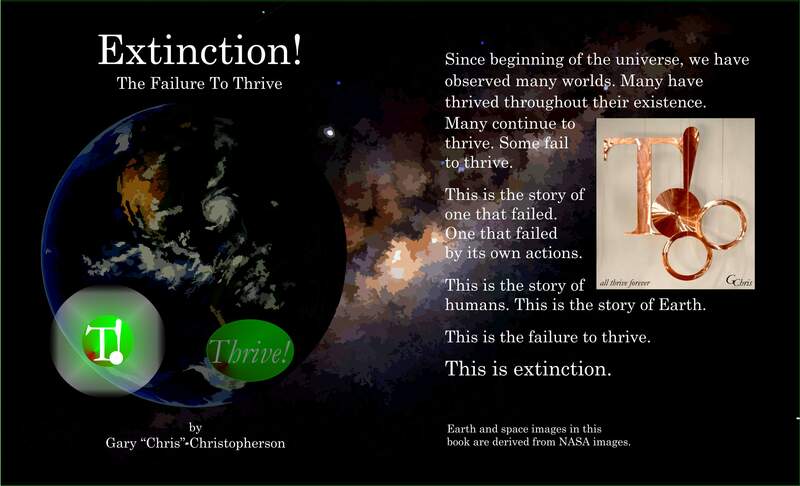 Note: In Chris’ illustrated science fiction book – “Xtinct – Universal Justice for Earth, The Decider and Xtinct must apply universal justice to save Earth by deciding whether or not early human extinction. New Thrive! 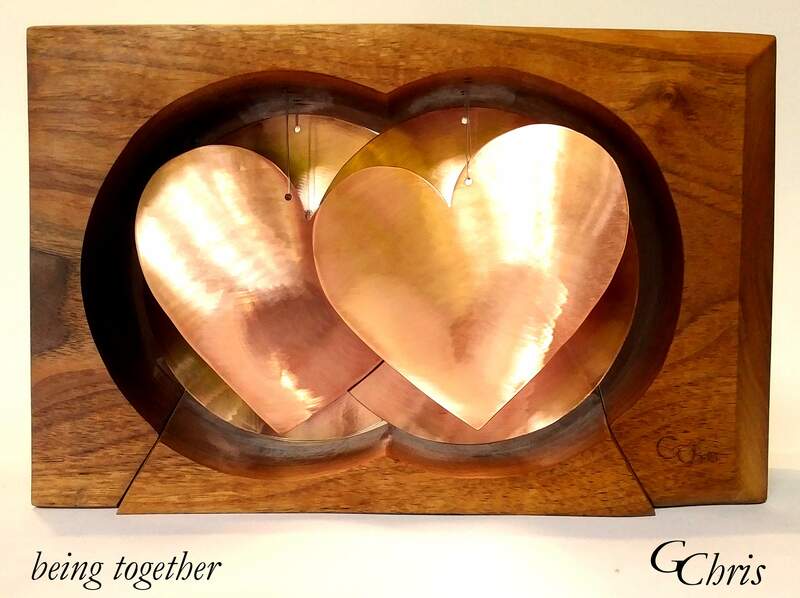 Sculpture by GChris – “being together”. 1′ x 1′ metal & wood stabile. Message: “being together” is positive togetherness of two beings’ hearts and minds aspiring for greater personal and public good. Message: Unify, what was once whole then torn apart, to create thriving whole. While the message applies broadly, it also applies to the effort to re-unify the Korean people, torn apart related to war, into a more thriving whole people. 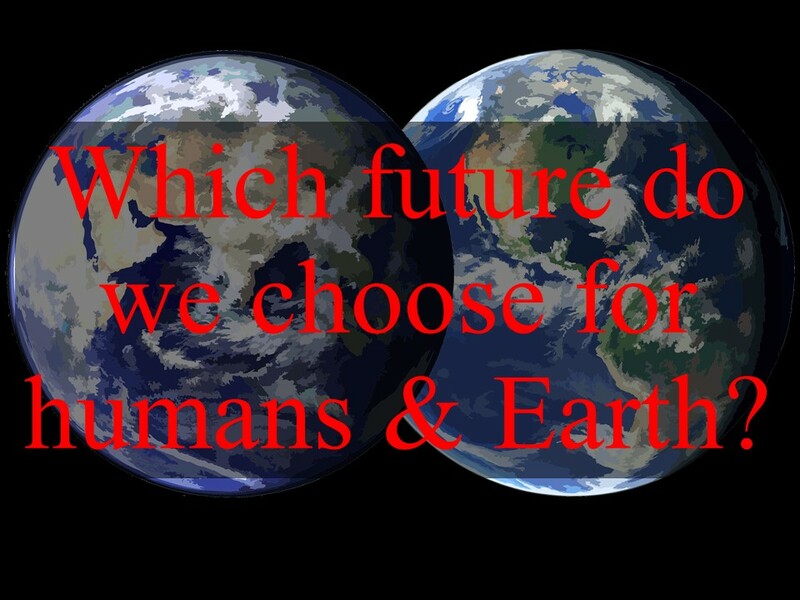 Which future do we choose for humans & Earth? Future we choose determines Earth’s future. Current Future Is Worst. Low thriving (all people, other creatures, & Earth) . High vulnerability. Early extinction for humans & other creatures due to humans. Thriving Future Is Best. Full thriving (all people, other creatures, & Earth) long term. Low vulnerability. Postpones extinction for humans & other creatures. New Thrive! 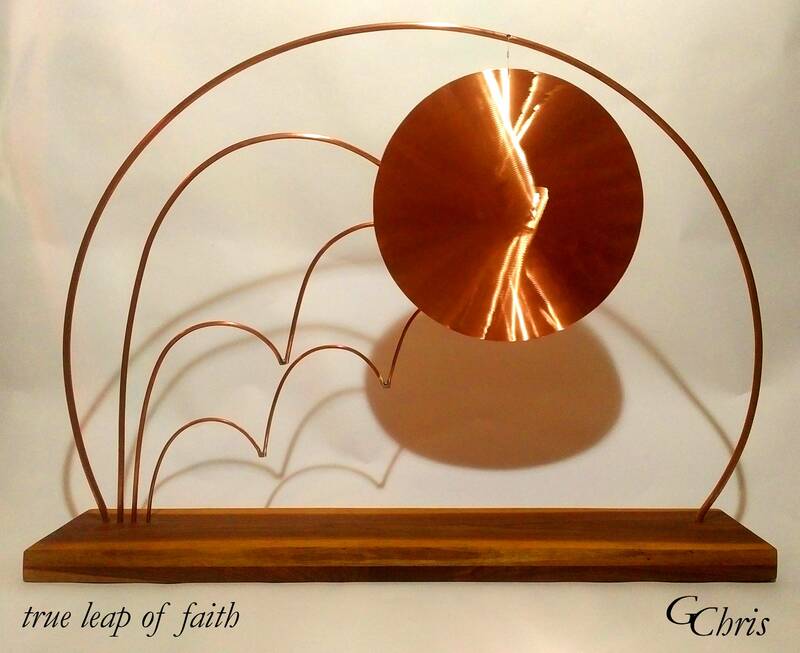 Sculpture by GChris – “true leap of faith”. Leap of faith from today’s constraints. Across chasms of doubt and insecurity. To future of true thriving and true love. Leap as if your very heart and soul were at stake. What can you do at The Thrive! Center? Thrive! Discuss and strategize our future. Extinction? Just surviving? Thriving? “All thrive forever”? Maybe you join Thrive! Endeavor – Call to action and a rallying cry for a better future. Thrive! – Vision and mission for those wanting to build a better future for all. HealthePeople. Discuss and strategize achieving healthy people. Best personal, community or country health system? HealthePeople – Integrated strategy and effective reform that would result in accessible, affordable and high-quality health systems everywhere. Thrive! Sculpture by GChris. Tour Studio/Gallery. Interact with 200+ sculptures. 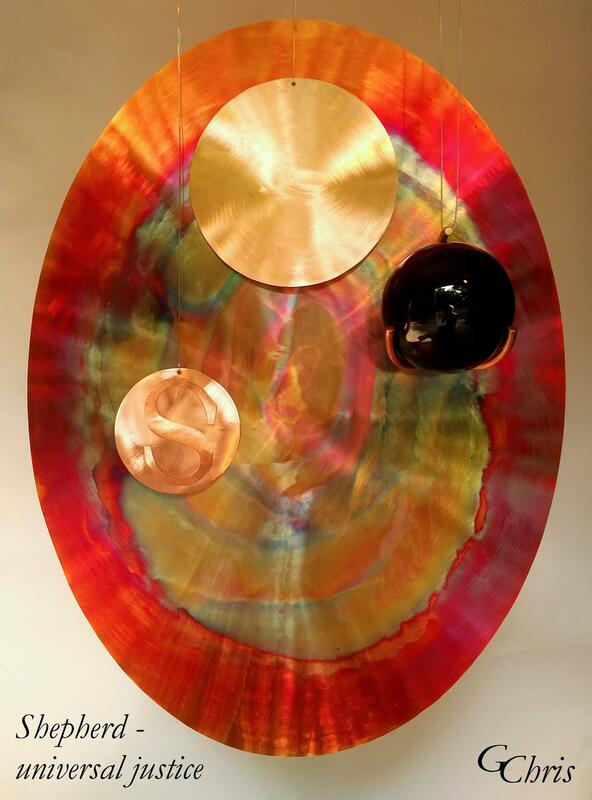 Copper and wood. Sizes from a foot to dozen feet. Some make sounds. Some move physically; some move conceptually. All generate shadows. All payments go to Thrive! scholarship fund. Thrive! Park. 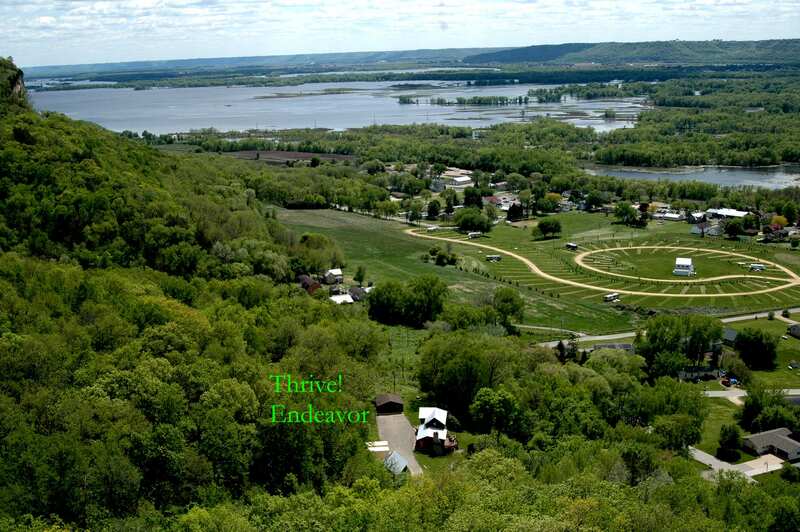 See great scenic views of Mississippi River and Lake Pepin. Walk/hike bluff side/top roads and trails year-round Experience goat prairie restoration on bluff sides/tops. Historic 1885 Era Bluffside Farm. Tour fully renovated/restored house, barn and beehouse with views of Mississippi River and bluff. Learn about life on small bluffside farm in 1880s. No species should have dominion over all other species. In the past, Shepherd and black box came to Earth. The mission was to build a better, thriving future for Earth and all its creatures. Shepherd had friends Taj and Jason committed to and helping achieve the mission. After many struggles, many commitments were made by Earth’s most capable species, humans. Some progress was made via a global Thrive! Endeavor. But no longer. Now Earth is on path to early extinction. Earth and all its creatures face early extinction. Humans are the primary cause. Earth’s humans are behaving badly. Humans are failing badly. Even worse, humans are now an emerging threat to other worlds. Humans are reaching further beyond Earth. They desire colonizing another planet like Mars. Because of bad human behavior, Earth must now face universal justice. But what will be universal justice for Earth? May be extinction for part or all of Earth. May be extinction only for Earth’s offending species, humans. The Decider, the universe’s powerful judge, makes preliminary decision of early human extinction. Xtinct, powerful holder of a black box, will make final decision for Earth. The end or not the end? New Video – Save our children. Save our future. Enormously proud of the children! Enormously angry at adults that have failed them. May children have the future they deserve. New Video – Stop killing our children. Stop killing our future. Stop killing our children. Stop killing our future. Since beginning of the universe, we have observed many worlds. Many thrive throughout their existence. Some fail to thrive. Some go extinct. This is the story of one that failed. One that failed by its own actions. This is the story of humans. Since the beginning of the universe, many worlds thrive throughout their existence. Many fail to thrive. Some go extinct. This is the story of one that stood at the edge of extinction. Thrive! Park is a new public park of the Village of Nelson and was donated by Gary “Chris” Christopherson. 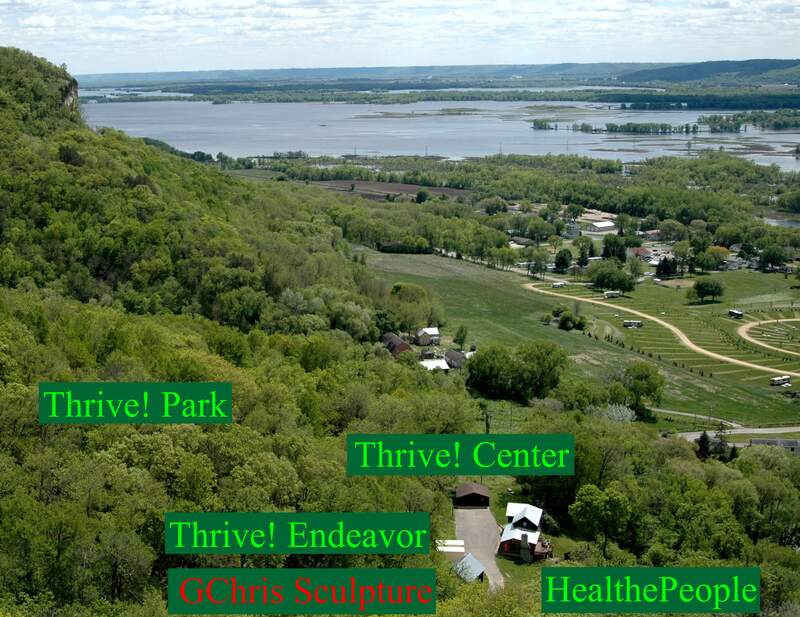 The Park is unique in that it consists of over 25 acres of Mississippi River bluff top and bluff side. The primary bluff is Three Sisters (northernmost Sister is private land) and Lost Brother. The three southernmost bluff tops (two of the Sisters and Lost Brother) are in the Park and accessible via hiking roads and trails. On the bluff tops and bluff sides are “goat prairies” that have recently been cleared as part of a larger prairie restoration effort around Nelson. The prairie restoration removes invasive and non-prairie plants and releases prairie plants to flourish in their native habitat. 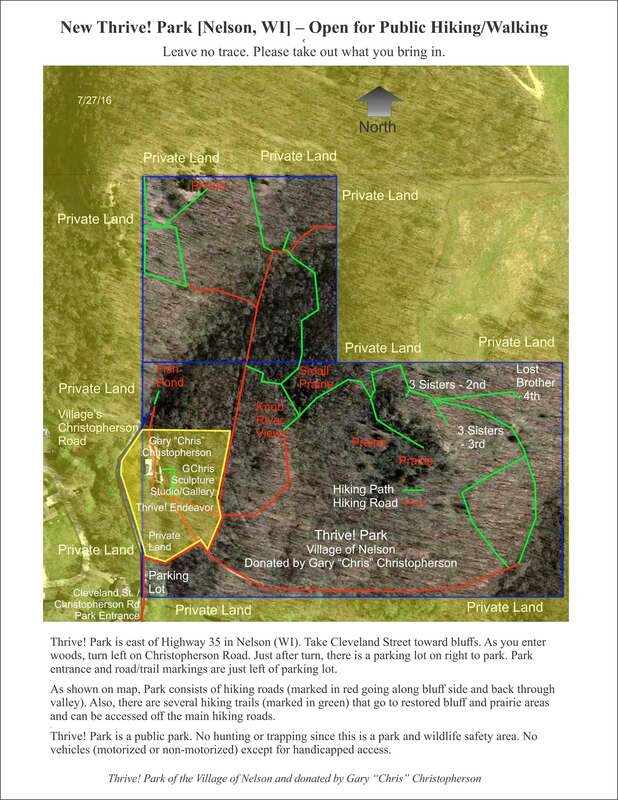 As shown on map [See Park map below], the Park consists of hiking roads (marked in red going along bluffside and back through valley). Also, there are several hiking trails (marked in green) that go to restored bluff and prairie areas and can be accessed off the main hiking roads. Signage in the Park serves as guides to roads and trails. No hunting or trapping is allowed since this is a park and wildlife safety area. Thrive! Park is located east of Highway 35 in Nelson (WI). Take Cleveland Street toward bluffs. As you enter woods, turn left on Christopherson Road. Just after turn, there is a parking lot on right to park. Park entrance and road/trail markings are just left of parking lot. Since the beginning of this universe, I watch. Over untold years and across untold worlds, I watched as things began, developed, matured, began dying, died and then began again. Each world is unique as is each inhabitant of each world. That continues to fascinate me. Each person, each community and each world is different and always should and will be. As I watch this universe, I continuously look for those who are interesting with large positive potential. On Earth alone, there are so many creatures. On earth, humans are the most interesting for both their negatives and positives. So much potential and yet their current path is filled with vulnerability, destruction and failings. Their future is at high risk. But the positive potential is there. If they can just find it. If they just use it. If they can and want to achieve their full potential, they will have a much better future. This sets the stage for what should come next, the Thrive! Endeavor®. 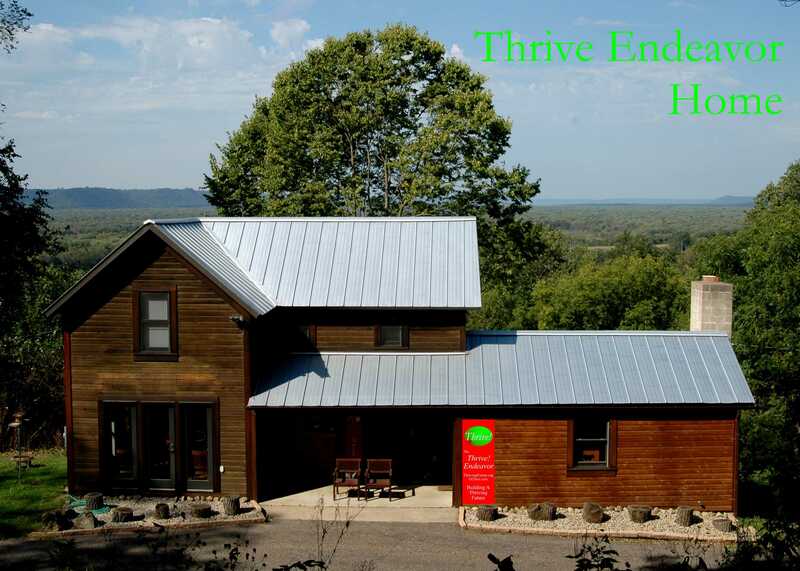 If this is Earth’s people’s choice, this endeavor provides the hope for the ultimate, positive future – All Thrive Forever®. Donations to New Thrive! Scholarship Fund – Thrive! Scholarship is endowed by Gary “Chris” Christopherson and administered by University of Wisconsin Foundation and Department of Political Science. Goes to UW Madison students likely to make positive contribution to creating large, positive, timely change that achieves a surviving and thriving future for all forever. To make tax-deductible donation, go to www.supportuw.org/give. In Designation Field select other and in Gift Note Field enter Thrive! Scholarship Fund. 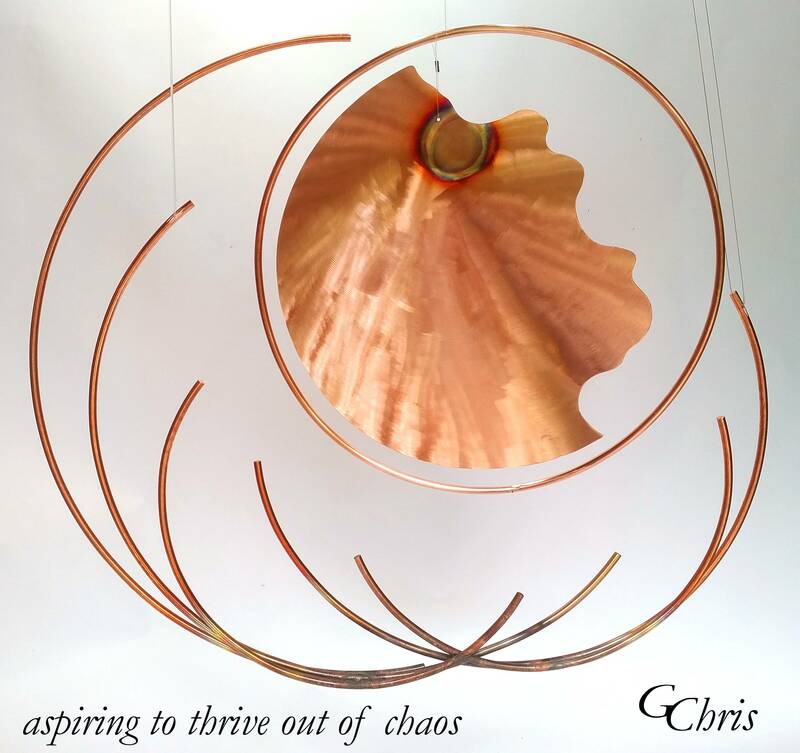 Just published children’s book: T!rrific [terrific] – What will you do to thrive? Available via Amazon in print and Kindle and via free download at www.GChris.com. 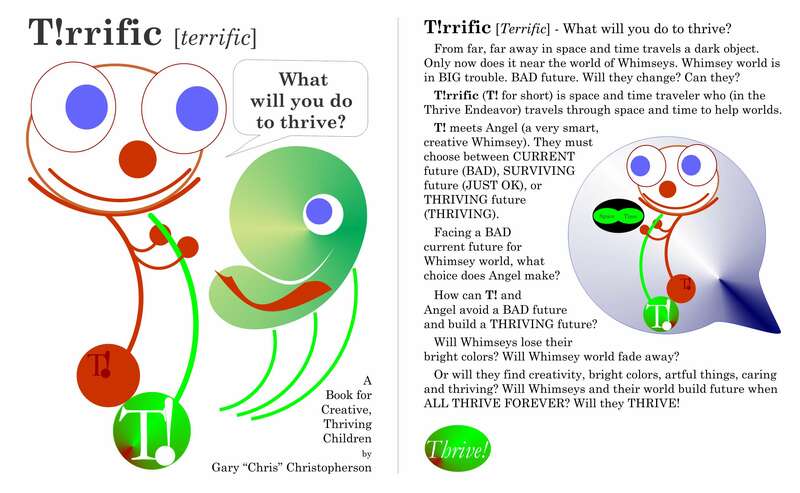 Just published children’s book: T!rrific [terrific] – What will you do to thrive?Available via Amazon in print and Kindle and via free download at GChris.com. T!rrific – What will you do to thrive! Children’s Book Cover. From far, far away in space and time travels a dark object. Only now does it near the world of Whimseys. Whimsey world is in BIG trouble. BAD future. Will they change? Can they? T!rrific (T! for short) is space and time traveler who (in the Thrive Endeavor) travels through space and time to help worlds. Facing a BAD current future for Whimsey world, what choice does Angel make? How can T! and Angel avoid a BAD future and build a THRIVING future? Will Whimseys lose their bright colors? Will Whimsey world fade away? Or will they find creativity, bright colors, artful things, caring and thriving? Will Whimseys and their world build future when ALL THRIVE FOREVER? Will they THRIVE! Thrive! Books – Available via Amazon.com or as free downloads below. Thrive! Endeavor® – All Thrive Forever. Thrive!® – All Thrive Forever® [What will you do?® The Game.] Thrive!® -Quick Guide To A Thriving Future [For All Forever]. 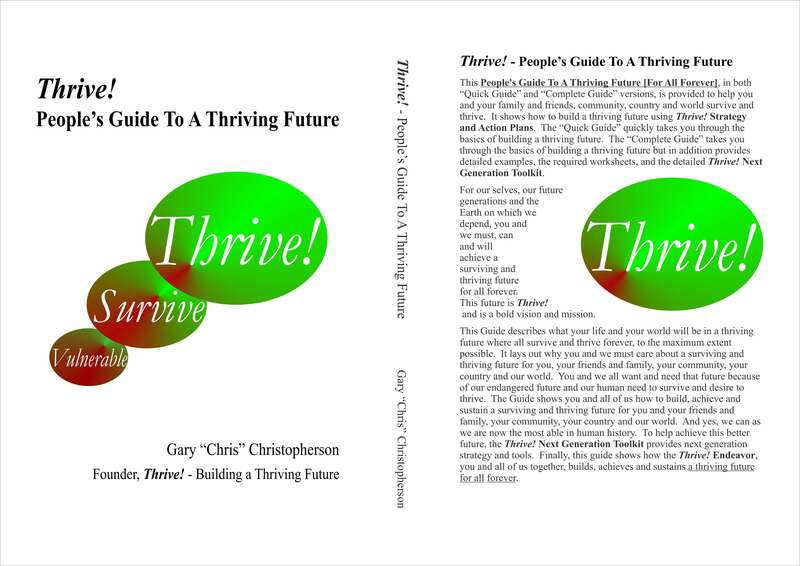 Thrive!® – People’s Guide To A Thriving Future [For All Forever]. Thrive!® – Building a Thriving Future. The Thrive!® Philosophy – All Thrive Forever. Behavior Effectiveness Model (BEM). 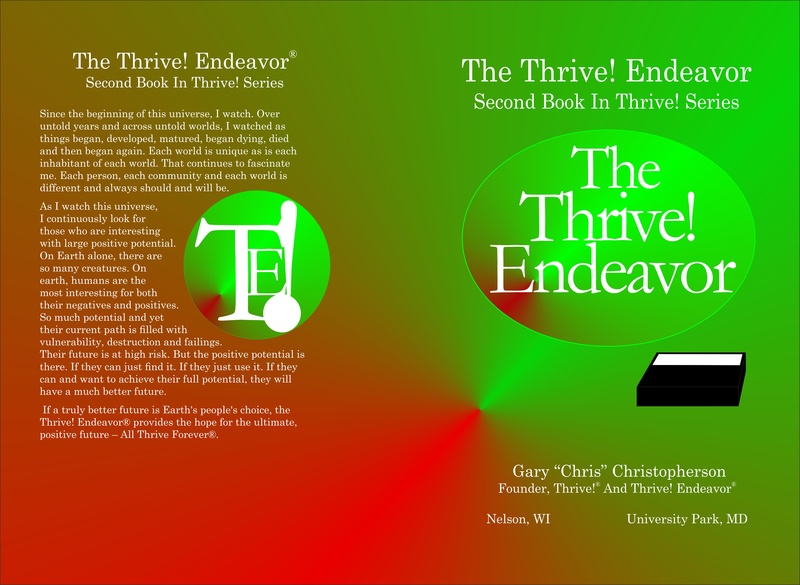 Thrive Books – Available via Amazon.com or as free downloads below. Thrive! Endeavor® – All Thrive Forever. 2015. Paperback and eBook. Thrive!® – All Thrive Forever®. What will you do?® The Game. The Challenge. 2015. Paperback and eBook. Thrive!® -Quick Guide To A Thriving Future [For All Forever]. 2013. Paperback and eBook. Thrive!® – People’s Guide To A Thriving Future [For All Forever]. 2013. Paperback and eBook. Thrive!® – Building a Thriving Future. 2011. Paperback and eBook. The Thrive!® Philosophy – All Thrive Forever. 2015. Paperback and eBook. Behavior Effectiveness Model (BEM). Building Thriving Future Using Behavior Effectiveness Model (BEM). 2015. Perback and eBook. “What will you do?” is the essential question posed by this blog’s vision and mission. Challenges you and all of us to do what will achieve a thriving future for you, your family and friends, your community, your country and our world. If we do, then we succeed in achieving a thriving future for all forever. Thrive! – All Thrive Forever!